Before Memorial Day gets here and you are scrambling to figure out what to cook for your get togethers, I thought I would share with you some of my go-to, quick barbeque recipes. Most of us don’t have all day to spend prepping for weekend parties, and so these recipes are really fast with a few shortcuts (love the semi-homemade tricks every now and then). Not to mention, everything you need for your barbques are on sale this week (bbq sauce, mustard, ketchup, relish, hamburgers, hot dogs, buns, pork and beans, bacon, chicken, watermelon and MUCH more!). Login to our website to find the best deals in your area. In a saute pan, place the bacon and let it cook on medium-high heat until it's golden brown and crispy. Once the bacon is crispy, remove the bacon from the pan and let it rest on a paper towel. Remove some of the bacon fat from the pan, leaving about 2-3 Tbls. of the fat. Add the onions to the bacon fat in the pan and saute the onions until completely tender. Once the onions are tender, add the diced bell pepper and cook for another couple of minutes. Season the pepper and onions with the pepper, cayenne pepper, liquid smoke, and garlic powder. Pour this mixture into a crock pot. Into the crock pot, pour the pork and beans as well. Stir the mixture together until combined. Crumble the bacon into small pieces and stir into the baked beans. 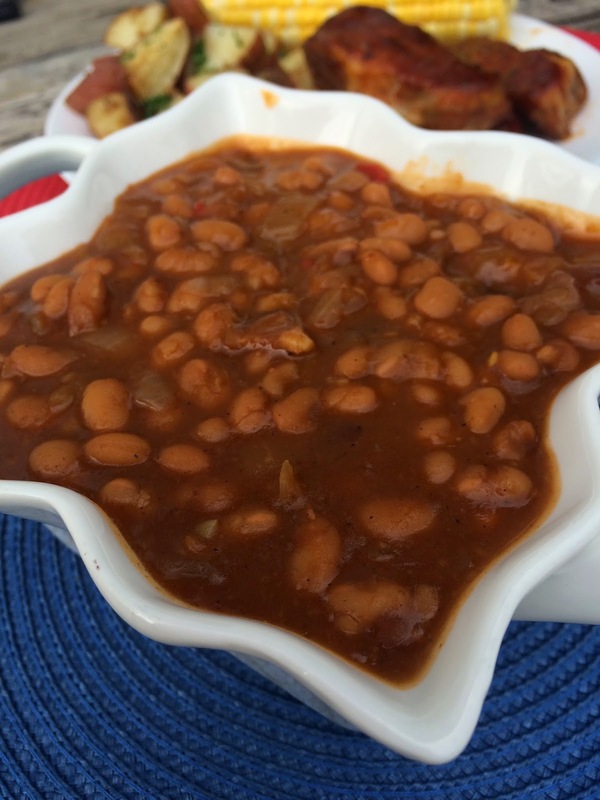 Pour the bbq sauce into the beans, stir and place the lid on the crock pot. Let the beans simmer on low heat for 3-5 hours, or until ready to serve. Serve beans warm. If you don't wish to use the crock pot method, just add pork and beans to the sauce/soup pot and let the beans simmer on low until ready to serve.